Emotional Intelligence is becoming a more challenging skill to develop in a world of distraction and instant gratification. Are younger generations losing their capacity for self-reflection, and the ability to recognize complex emotional states in themselves and others? Constant input from texts and social media bombards our senses, and unless we have set specific boundaries to protect our personal time, every inch of it is being filled with new sensory input. For teens whose impulse control and sensory filters may not as yet be highly developed, this may be laying the foundation for an entirely different style of relating to others. People are constantly communicating through facial expression, voice inflections, and body language. Unless teens make the time to identify what they’re feeling, and digest their uncomfortable emotions, these unvoiced emotions will leak out in unconscious ways. Only when they learn to communicate consciously and authentically with the people they care about, can they experience a real connection. Being able to recognize complex emotional states in themselves and others is the foundation for empathy. Empathic interactions allow a bridge to be built between separate minds, creating an opportunity for unity and understanding. Neural pathways are literally formed in the brain in response to heartfelt shared communications. Emotional intelligence is essential to repair ruptures in our relationships. Without making time for internal assessment and empathic dialogue, the repair stage will get skipped, with conflicts being swept under the rug – rather than resolved. This repair stage is required for the creation of true intimacy. With an emphasis on using technology devices to communicate, the development of emotional intelligence may be being overridden by the need to sort through and process large quantities of information. Emotional intelligence and social empathy skills are at the heart of developing and maintaing loving relationships, and I can help your teen to discover the middle ground. Does your teen son or daughter have an Asperger’s diagnosis? Teens with Asperger’s Syndrome frequently present with an above average IQ, leading teachers, extended family and friends to even question the diagnosis. This condition is often misdiagnosed as something else, and thus support for the family is delayed. Although the inclusiveness of elementary school children may have shielded your child from the pain of social rejection, middle school is a time when it could be helpful to have a professional teach your teen the coping skills they need to thrive in the world. These skills begin with how to manage the teen’s nervous system’s fight-or-flight response to overstimulation by internal and external sensory input. This is accomplished by learning to become mindful/ self-aware of what they are experiencing in their bodies. From there, learning positive self-talk and self-soothing techniques can help create the space for them to move on to learning goal-setting, time management, and how to respond to criticism, disappointments, and change. Last, but not least, as they become more comfortable in their skin, they now have the bandwidth to begin mastering the art of social skills. Raising an atypical teen, who’s path of development may be a little more complex than others, may prove challenging to parents who find themselves having little to no reference for what their teen’s internal experience is like. It is not uncommon for parents to get impatient, and even angry when they observe their teen hiding out in their room on their computer. It is essential for parents to learn how to advocate on their son or daughter’s behalf. It is also helpful for parents to enlist the support of a parenting coach, to help them manage their fears, frustrations and concerns, as they walk forward in this process. Atypical teens are some of my favorite clients to work with! They are smart, delightful, and funny, just wanting to be seen and accepted for who they truly are. 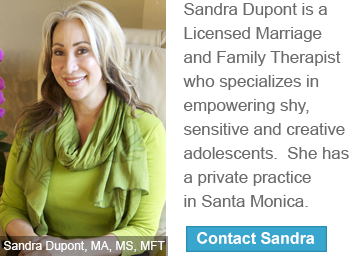 If you live in the Los Angeles area, allow me to demonstrate the support I can offer by scheduling a free parent consultation. Learning to love themselves is one of the most important lessons in a teen’s life. It is not uncommon to experience a challenging adolescence. However, your teen need not shut themselves off from the world because of this. Through acknowledging their feelings of loss and disappointment, they can begin to move beyond them. It is essential for teenagers to understand how they have grown from their experiences. Your teen also needs to know that everyone on this earth has a unique journey and expression, with different gifts and opportunities. When a teen compares themselves to others, it can negatively affect their self-esteem and confidence, making them feel envious, jealous, and even depressed. Striving to become one’s personal best is a much healthier option. Is it time for your teen to stop focusing on the person they wish they were — and learn to acknowledge and love the person they actually are? It is essential for your teen to make the connection that they are not their actions, appearance, worldly possessions, or grades, but rather someone who continuously strives to reach their goals, working hard when necessary, with the determination to keep going. A mature young person will ultimately be able to make heartfelt connections, know when to say no, reach out for assistance, reflect on their feelings, forgive themselves and others, and design a life that fits their unique expression. Would your teen benefit from working with a mentor? Consider the idea of establishing weekly family meetings where you can think together with your teen on any challenges that arose during the week. I understand that everyone’s schedule is already full, and this is one more thing to add to that equation. However, just like preventative health practices, coming together as a family for a Sunday night dinner and a chat might make the difference between a year of greater connection and cooperation, or a year that mirrors the last. Keep the meeting brief. Kindness is key. Be sure to model patience and a collaborative spirit. Remember, your teen is watching and learning from you. The intention is to create the time and space to work through challenges your family is encountering, individually, or as a unit. You can begin with everyone sharing one “win” from their week and one “bump in the road.” This is the time to simply empathize, without advice. Then each person can be invited to bring up one item that they would like discuss. You may decide to tackle the easiest issues first, but if there is a pressing issue, that can also be a good starting place. The person sharing has a couple of minutes to present their topic. Then, each family member can ask for clarification, and/or give a helpful suggestion. At the end of the collaborative feedback, the person initially sharing can summarize his/her options and decide how they would like to proceed during the coming week. Some topics may come up for multiple weeks, as trial and error reveals more effective options. One example is a parent requesting their teen take responsibility for leaving on time for school. One option may be to set a morning alarm, instead of relying on mom to wake them up. Another option might be going to bed sooner at night. Another option might be taking a shower the night before, and laying out one’s clothes ahead of time such that all that is required is to roll out of bed, get dressed, eat breakfast and go. Each family has its own style – and personalities. I have noticed that families function better when they act as a team, listening to each other, helping each other, and reinforcing/ strengthening their connection a regular basis. If your family is struggling, I can definitely help! Call today for more information. Not All Teens Need Therapy. Some parents are hesitant to take their teen to a therapist to address challenges they may be facing, afraid that they will be labeled “problem” kids or emotionally disturbed. Seeking my assistance as a Teen Life Coach and Mentor offers yet another opportunity to remedy these problems. 10+ years as a Teen Therapist has paved the way for my developing creative and positive ways of supporting teenagers. I provide a safe, non-judgmental space for your teen to explore their obstacles, ask their questions and express their feelings. In contrast to therapy, where the therapist is seen as the expert, life-coaching can be presented to your teen as a collaborative effort between myself and your teen. My focus is ultimately on helping your teen create a vision of the life they would like to create, and supporting them in their journey towards that goal. Sometimes you may not have the time or energy to be as available to your teen as you would like. It has been said that “It takes a whole village to raise a child.” It can be reassuring to know that I am available to assist you in guiding your adolescent towards becoming their best version of themselves. Self-medication is often an attempt to avoid uncomfortable emotional states. Adolescence, with all the changes that accompany it, can be an intense time where teens are often overwhelmed by new feelings. Many kids so strongly dislike feeling sad, anxious, angry or insecure that they will do anything to avoid these feelings, such as drinking and/or taking mood altering chemicals. Experimentation with drugs seems to have spread to include middle school, or even younger. In a society where we have become extremely technological, many people have disconnected from nourishing relationships in favor of virtual ones. From television viewing, to Internet surfing, to text messaging–people are spending more time with their phones and computers. The co-regulation of emotional states, once available to teens through chatting with parents, siblings and extended family members, neighbors and friends, is getting interrupted through less emotionally fulfilling forms of interaction. In a perfect world, children learn how to deeply connect to others in the early stages of their life. Recent research in brain function has proven that love is a human necessity; its absence damaging not only individuals, but to our whole society. Close emotional connections actually change the brain in those who engage in them, affecting both our sense of self and experience of life, making empathy and socialization possible. Teens who entertain themselves solely with computers can be left vulnerable to feelings of low self-esteem and hindered social skills. Ideally, we want to understand a teen’s relationship with their drug of choice. How often are they using? Why this particular drug? What negative feelings are they trying to avoid? If you have noticed changes in your child’s behavior that leads you to suspect that drugs are involved, call me! Might your adolescent have a learning disorder? Read on to learn about special school accommodations that can be provided as support. Psycho-diagnostic testing is used to determine the cause and nature of a teen’s difficulties with academic performance. These tests can either be administered by a private psychologist, or through your school district. These tests often identify potential learning disorders. Being moved to the front of the classroom. Receiving extra time on tests and quizzes. Being excused from participation in Physical Education classes. Being excused from having to study a foreign language. Written instructions from the teacher regarding homework assignments. Access to the school psychologist during school hours. Extra time with the teachers. While learning disorders do present a challenge to your teen’s academic success, they do not need to derail their educational process. With emotional and educational support, teens with learning disorders can have a positive and successful high school experience. Does your teen have the social skills that will lead them to success? More than ever before, there is an increasing need for social skill-building experiences for young people. I help socially anxious adolescents to identify areas where they can improve their social skills, and then teach them tips and tricks to improve those skills. I can help your teen learn how to gain and keep more friends, as well as become more confident in social situations. The value of your teen working with me privately, rather than in a group setting, is that I can give them direct feedback specific to their situations, as well as create exercises, role-playing and homework that will help them achieve their personal goals. The teens that have worked with me report greater peace and satisfaction in their social lives. I usually work with teens for 6 to 10 consecutive weeks, depending on the desired result. Some teens prefer to meet twice-weekly, to obtain a more rapid outcome. My style of working with a teen is collaborative and fun. Although I respect that the challenges they may be experiencing are serious, I have found that a joyful atmosphere makes the learning feel more uplifting and comfortable.